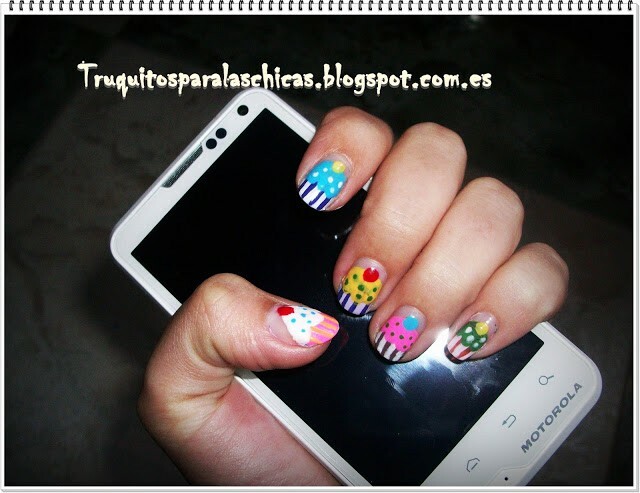 Today I bring a easy manicure of cupcakes for short or long nails, which is very original, striking and beautiful. I like this manicure a lot, it's because I'm addicted to sweets and it makes me want to eat my nails. - Enamels of various colors. - Tools for making small and large dots, we can use a toothpick, the tip of a bic pen or anything that happens to you. 1. The first thing is to paint the nail in the final part, I have painted each one of a color, but if you want all the same will also be very good. 2. Then we painted a few lines of different colors, trying to stick with the color we have chosen before. 3. We make the cake shape, very carefully, waiting for all the previous layers to dry properly. And well when I have reached the fifth step I realized that my head is very bad, because I finished painting my nails and I forgot take my photos, thank goodness I still have them painted like this. In the last step I painted some very small points as if they were confetti. To me the nail that I liked the most is the thumb. What do you like most about this cupcake manicure? Do you like easy manicures ?